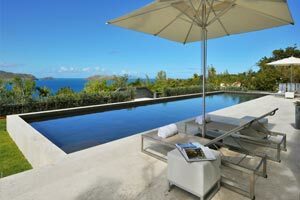 Villa UJV 401, also referred to as La Petite Sereine, is an ultra modern and spacious, 5-bedroom villa in the heart of Pointe Milou, with sweeping sunset views. This brand new villa breathes luxury and class, and with its black walls around the large property it stands out in the popular area of Pointe Milou. 5 years in the making with meticulous attention paid to every detail. The spacious living room has a large sectional sofa with a marble table as its centerpiece. The living room is air-conditioned, but can also be opened up to the spacious covered outdoor living area, which is furnished with inviting sofas and chairs where one can relax and watch the sunset, while sipping a cocktail. Also located on the covered terrace is a large dining table, which seats ten guests. An office space, which can also serve as a small bedroom for staff, is located just off the living room, and comes with a full guest bathroom. The air-conditioned kitchen is modern and well-equipped. An outdoor grill area is set outside of the kitchen and is equipped with extensive counters, a sink, and a large gas grill. There is a second dining table next to the grill area. Two bedrooms are located on the main level with three additional rooms on the lower level. All bedrooms have a king-sized beds and are equipped with equal amnities. Each has a modern bathroom with overhead and hand-shower. On the lower level, bedroom 4 and 5 can connect, and are ideal for parents with young children, or for teenagers. These bedrooms have separate access. Two heated pools complement this villa. A smaller pool is on the main level and a large lap pool is on the lower level, surrounded by comfortable loungers to soak in the Caribbean sun. Although the villa is in the heart of Pointe Milou, it was constructed in a way to offer maximum privacy to its occupants. This villa comes with a breakfast chef, 7 days a week housekeeping with a turndown service at the end of the day, laundry service, as well as a rental car (Terios).